my new gpa ... and happy 1st birthday katelyn rose! 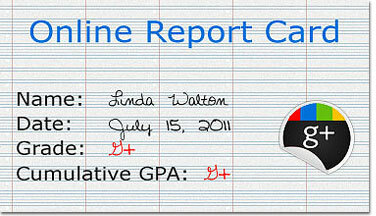 GPA might also be translated to: Google Plus Addiction - LOL! I owe y'all big time! Please forgive me for neglecting to put on my blinders this week, but something bit me and I've been under it's spell for the past several days! Yup, I would be referring to Google+! I am not a technical writer, but just wish to let you know why I am really liking Google+, even better than Facebook. It is extremely user-friendly, much more private (in my opinion) and you can communicate with groups of people in the circles that you put them into. In other words, and unlike Facebook, if you post something to your status in Google+, you have the option right then and there as to who you wish to see it. Let's just say it's like incorporating a private messaging system and a public one all in the same place rather than having to open a separate window or being taken away from your current page. I am so loving the circles concept! If I wish to post a link, photos, a random thought, etc. and don't wish it to be seen by some who might not be interested, I can post to only those circles that I add in via the click of my mouse and this way I won't be bombarding everyone with my posts. By the same token, I can arrange people into different groups that like to share a lot of links, previews and such, so that rather than wading through them to find something I might really be after at the time, I can simply choose the circle or circles of the streams I wish to view at any given time. While Facebook has a lot of good features, I really, really like the simplicity of Google+ in being able to effectively communicate with others. Plus, at this point, no games! Just good quality communication and feedback! My head is swimming with all that be done via Google+ and it will take me a few weeks to really determine how I wish to integrate it into my business and personal life. I, personally, love the ease of mixing both my business and my pleasure on one page. Although, I've always considered my business and pleasure to sort of be one and the same! LOL! Yah, I love y'all all the time! I would love to have you come and join me there! It's a great place to hangout (this allows 10 people to come together for a video chat/conference), to voice chat, type chat, or to just sit back and see what others are up to! Oh, and when I say it is more private than FB, I really like that you can log on, stay logged on and no one knows you are there unless you are streaming your status publicly or to all of your groups. The way I see it, G+ puts us in more control of how we wish to communicate with others in a safe, time effective manner without getting overwhelmed by all that is being posted by everyone else - unless, of course, we choose to! For those already on Google+, I would love to hear your thoughts thus far. If any of you are in need of an invite, leave your email address in the comments section and I will send you one as they are still in beta and looking for lots of good feedback (what you like and what you don't like) before opening up to everyone. Have an awesome weekend everyone and I hope you will come and take a look around at G+. If you have any questions that I am able to answer, I am more than happy to. We will be working with our furbabies this weekend, so I hope to have Part Two of *Getting Your Brush On* uploaded by Tuesday with, perhaps, an extra goody included for your patience with me! 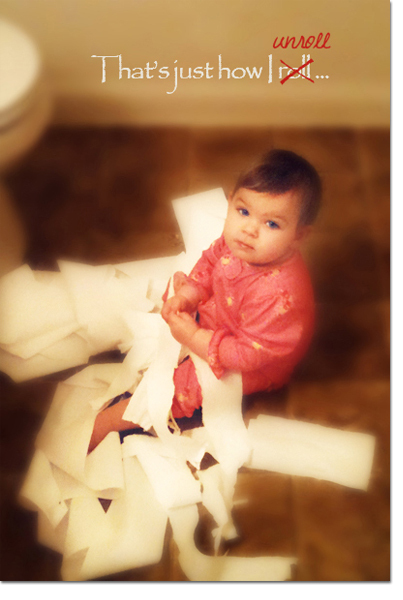 Or, should that be unroll? LOL! 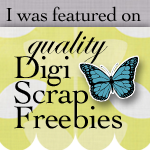 I've just started my Photoshop classes with Andrea Gold over at Go Digital Scrapbooking and I am hunkering down to prep kits for uploading to my MyMemories store. There have been lots of changes going on there and I thought I'd wait for the dust to settle a bit while at the same time tending to our Golden Girl the past couple of weeks. Once I get a few kits uploaded, I shall update y'all on what's happening at MyMemories! They are really getting their scrap on! I am excited to finally get it going on! O.B.S.T.A.C.L.E.S. be warned, I am working with blinders on this week! ROFL! Wishing you all a most scraptacular week ahead and I hope to be back tomorrow with *Get Your Brush On*, Part Two! 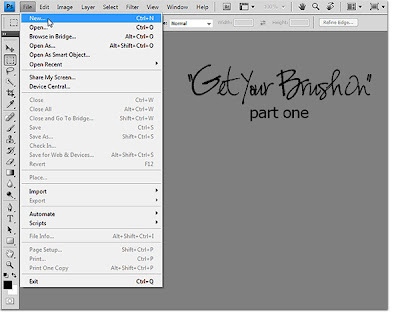 "get your brush on" tutorial, part one! Before I start today's tutorial, I would like to answer Gem's question about whether the *Monkeying Around* brushes will work in PSE (Photoshop Elements). The answer is yes! While I am not a PSE user (I design in PSCS 4), I do have a copy of PSE 4 that I installed on Robert's computer to give them a test and voila, they work! 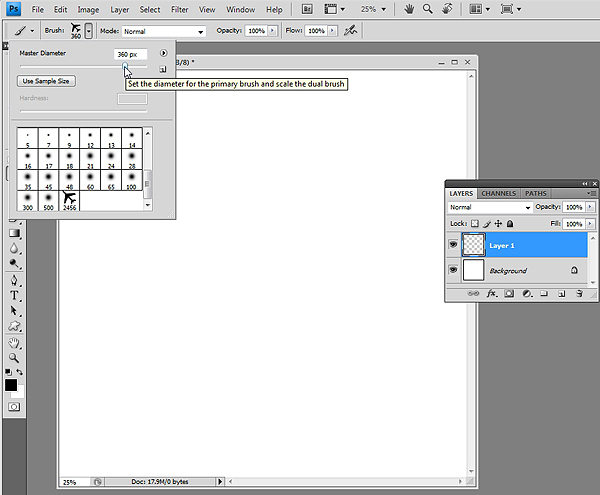 The only thing I was not able to accomplish is dragging and dropping the ABR file from where I have it stored and right onto the Photoshop work space. However, you are still able to load the ABR file to your brush palette from any location. Yay! Okay, let's get rolling with Part One of my Get Your Brush On tutorials! 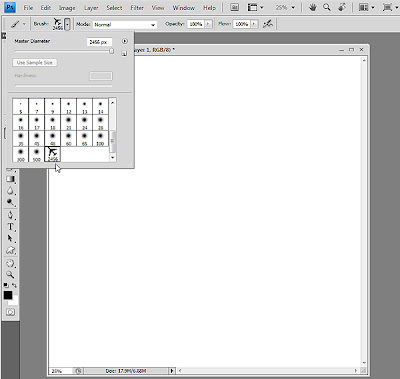 This tutorial will work in both Photoshop and PSE. 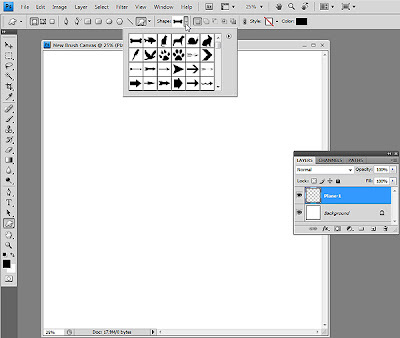 I will make a notation of any major differences I find when using the steps for PS in PSE. I will post screen captures first, followed by instructions (PS only). Note: Each screen capture may be enlarged for sharper details by clicking on it directly. Bigger is better! Yup, when it comes to creating a brush (or a custom shape), starting with a larger canvas is definitely better. 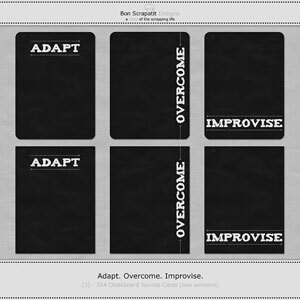 As most of us have come to learn in our digital scrapbooking and/or designing experience, it is much easier to start big and reduce if the need be rather than trying to enlarge an image. Why? Well, we can reduce without losing quality from stretching pixels that will ultimately cause for a distorted image upon enlarging to 100%, which is a no-no in Industry Standards in Graphic Design. Shrinking down an image is much easier (wouldn't it be lovely is this were true with a real, live physical image as well? *sigh*) and it allows you to use your brush over and over again without having to recreate it! Think of reduce, reuse and recycle! 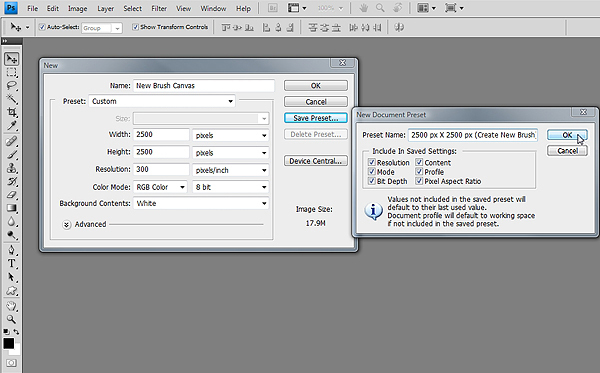 The largest size we are able to create a brush in Photoshop is 2500 px X 2500 px. So, unless you are wishing to do nothing more with your images than, let's say, create scatters, it will always be best to start with your canvas at 2500 px X 2500 px! You can select a smaller brush size once your new brush is installed and ready to use. I will give you an example once we've created our brush. 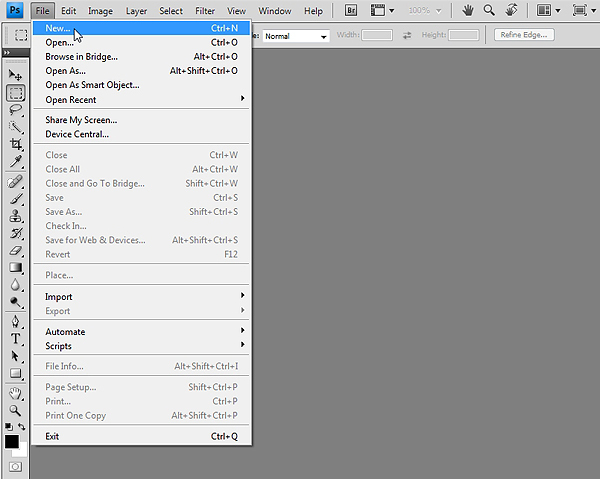 Note: I do not use keyboard shortcuts, however, you will see them as I use the drop-down menus in the event you wish to do so. Why don't I? Hmm, I guess I take after my kitties. I'm a pretty good mouser! LOL! I am inserting an extra step here as we are creating a custom setting for a canvas size of 2500 px X 2500 px so that we will not have to type it in each time we wish to create a new brush. Now this is my kind of shortcut! 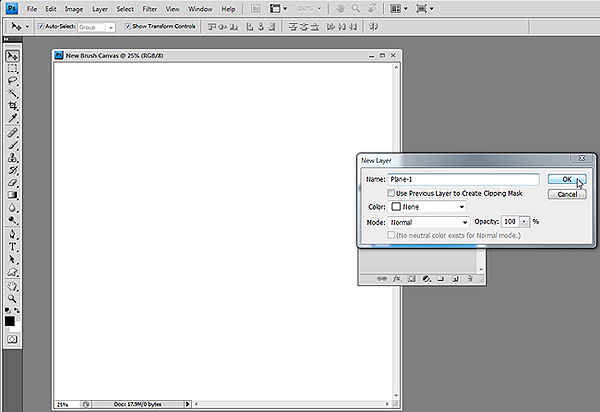 In the New Document Preset window, give your preset a name. Keep all boxes ticked under Include In Saved Settings. Click OK. 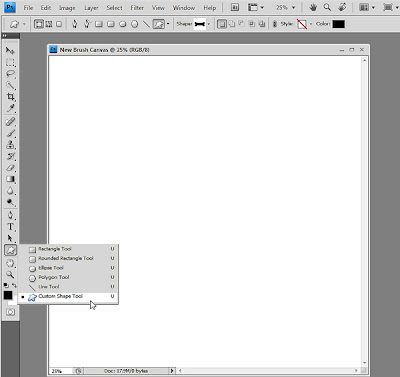 Note: The next time you wish to create a new brush, Click on File > New and then click the drop-down arrow next to Preset (Clipboard), find your 2500 px X 2500 px Custom Preset, click on it and then on OK to open your new canvas. 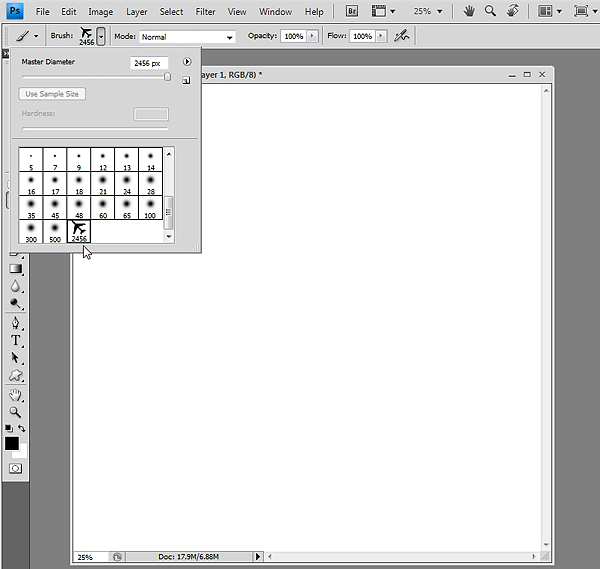 Note: We are going to create a custom shape from which we will then create our new brush! 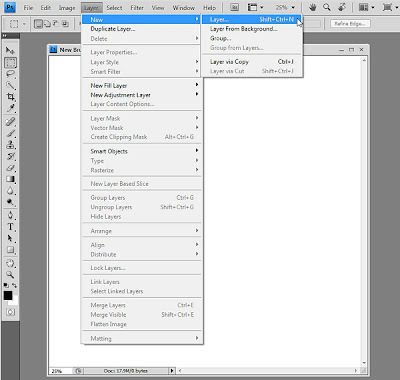 Give your new layer a name if you wish to. 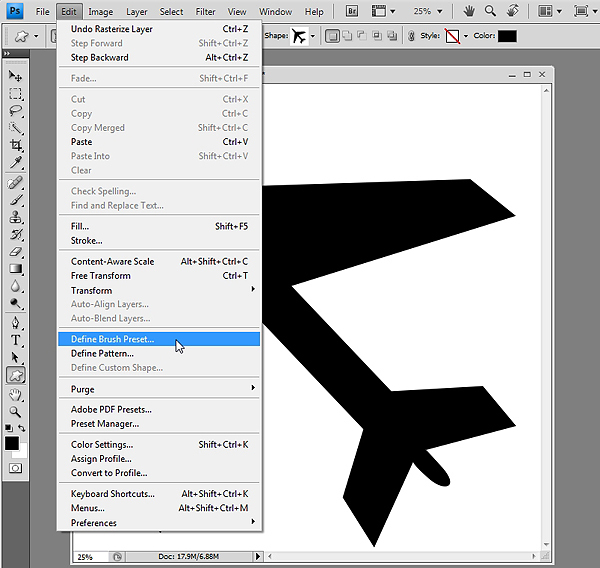 Click OK.
Find your Custom Shape Tool in your Tools Palette and click on it to open. On the Custom Shape Menu, click on the Drop-down Arrow beside Shape and choose a shape you wish to use for your new brush and click on it so that it shows as the image next to Shape. 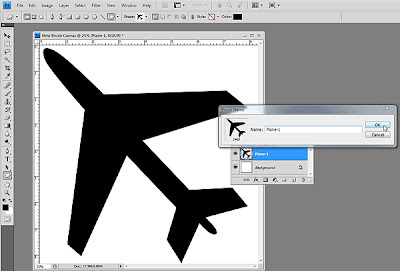 I have chosen an airplane in hopes that I can fly y'all right on through this tutorial! Note: I was unable to capture the cross-hair for this step, so the arrow is taking it's place. 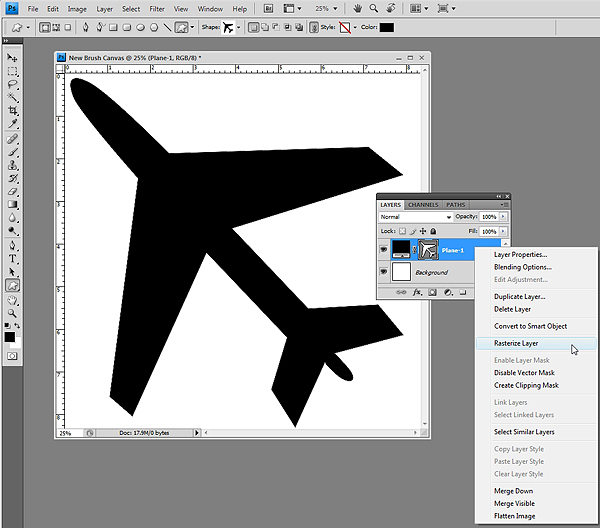 Make sure that your New Custom Shape Layer (mine is Plane-1) is active (mine shows blue) on your Layers Palette. 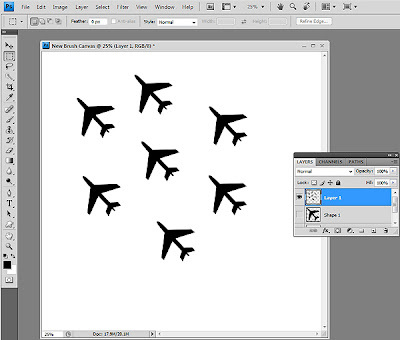 Set your Foreground color to black or a dark shade of gray. Place the cross-hair in the upper left-hand corner of your canvas. While holding down the Shift Key, drag your shape as far down as you are able to without going off the canvas. Make sure you keep the Shift Key depressed to assure your image is drawn out proportionately. You may notice that your Custom Shape is a little rough around the edges and this is nothing a little Rasterizing or Simplifying won't take care of! Ready to start getting your brush on? Give your new brush a name. This is important for identifying your brushes once loaded into your Brush Palette. Note: I missed a screen shot! Argh! I know I may be overly detailed for most of you, but there are always newbies that might not yet know where all the tools are. Find your Brush Tool in your Tools Palette and click on it to open the Brush Menu at the top of your Photoshop Desktop. 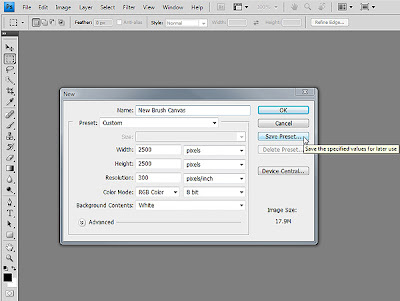 Locate the Drop-down Arrow to the right of Brush and click to open the Brush Preset picker. Your newly created brush will the very last one in your Brushes Palette as shown above with the arrow pointing to the airplane. Note the size is just a bit shy of 2500 px X 2500 px and that is okay. It is still a large brush and will serve us well! Voila, now you can really get your brush on ... your canvas! 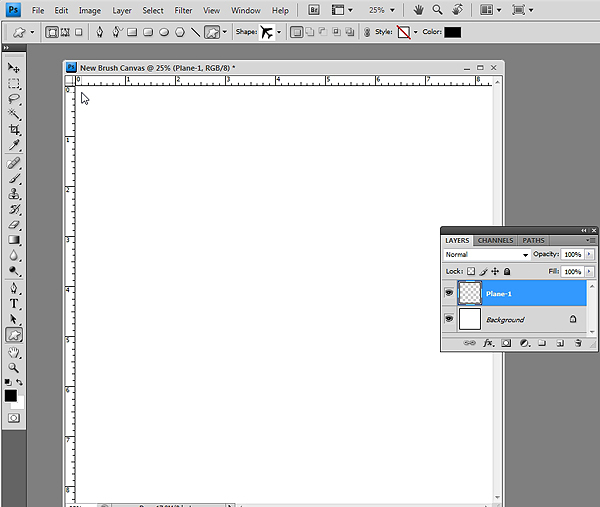 In the image above, I have simply chosen my brush, reduced it's size and clicked on my canvas several times to check out it's appearance. Get creative! Play ... play ... and then play some more! Create a new layer for each brush stroke, add effects, colors, etc. In Part Two of my *Get Your Brush On* tutorials, I will show y'all how to add Shape Dynamics and Scattering settings (these are different in PSE and I will do my best to duplicate what I've done in PS) to your brushes which, for me, make brushes so much more fun to work with! You can really let your imagination soar as your brush flows across your canvas! We will also save a set of brushes, creating an ABR file. Computer time has been scarce the past 10 days. Robert and I have been nursing our Golden Girl, Chloe, who turned 13 on June 9th, back to health. She had us very concerned for several days and I am happy to report that she is doing better and better with each passing day! Happy July everyone and have an amazing week! I will catch up on your comments this week and if you have any questions regarding today's tutorial, please ask in the comment section and I will reply to you as quickly as I am able to. Also, if any of you have anything to add, please do! As I've mentioned in the past, I'm pretty much self-taught and I have no doubt that I may take the long way around often, so I welcome your tips and tricks too!